I am a talkative girl from India. I finished my Ph.D from Indian Space Research organisation, Bangalore. It is situated in South of India. I love to travel. My love for analysing human psychology means that I also like to meet new people. I was always fascinated by science because it has a lot of practical applications in day to day life. Thus I chose to do science. I wanted to be in the field of research because I get bored if things are the same every day. Research is about finding something new. I like drawing conclusions based on practical experiences and so I like working with instruments in the lab. Dislikes do always follow likes because life is all about pairs of opposites. I come from a country with a large population, where researchers often don’t get their due respect because they are just one among the many people living there! This is disheartening at times. I also do not like the uncertainty tagged with this career. Hopefully, it all works out fine at the end! I am working in the Particle and Astroparticle Physics group at KTH. My research is related to space instrumentation. I am currently involved in the activities of developing a new instrument to measure polarization from Gamma Ray Bursts (GRBs). I am learning more about detectors which I have not worked with in my previous years of research. So it is very interesting. I am attending some lectures on spacecraft engineering from which I hope to learn more about satellite technologies. I am good with my hands when it comes to being in the laboratory. I am more organized and tidier than most researchers when planning and executing experiments. I am being exposed to new software tools that are needed to understand different aspects of instrument building. I would love to learn these tools and use them for my experiments. I really got excited when the latest GW detection was declared and the associated analysis was presented by many scientists. I would love to learn the details of how such a sensitive detection was made. Hopefully our GRB polarimeter can contribute more to this field. I am not good at coding so it is taking time for me to develop instrument simulation skills. As I am new to Stockholm, the weather and dark evenings make me feel tired sooner in the day than in India. If I offered you unlimited funding right now, to be spent on something scientifically relevant, what would you use it for? I would love to make a small X-ray detector (with integrated read out) for undergraduate students to play with. The goal would be to make it at a minimal cost so that all the universities can have this in their labs. I think my knowledge of detectors will help me build such a unit. I love Indian food especially because it is prepared with a combination of a variety of spices. After coming here, I have learned to prepare pasta with Indian spices and I love it. I wanted to be in instrumentation and found this position when I was looking for such an opportunity. The people in the group here have expertise in detection of X-ray polarisation from celestial bodies. I worked on a similar topic during my Ph.D so it was nice to join OKC for continuing in the field of my interest. Watching a movie or preparing a different/new food while listening to my favourite music is what relaxes me most. I would be happy to see a fully functional fusion reactor on Earth, providing abundant energy with a small input. And it would be nice to have tourist visits to our moon. 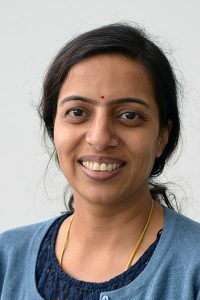 Rakhee is a postdoc in the SPHiNX group at KTH who joined the OKC in the fall of 2017.